Avocado Cheesecake is part of my series of posts 52 weeks of cream cheese. This recipe isn’t my own, this comes from a friend of mine, she has been in the catering business for years, but this recipe wasn’t hers either, she got this recipe from someone else. You may be asking yourself, what in the world is avocado cheesecake. First off, this is a dessert, it isn’t guacamole. This isn’t your super sweet dessert that you may normally think of when you have dessert. The almond nut crust really goes well with the creamy avocado flavor. The fruit salsa on top of the cheesecake is a fabulous touch. Avocados are a popular dessert ingredient in many areas of the world, avocado ice cream is surprisingly good, and worth trying if you get the opportunity. Here is my adaptation of Ms. Nees Avocado Cheesecake. 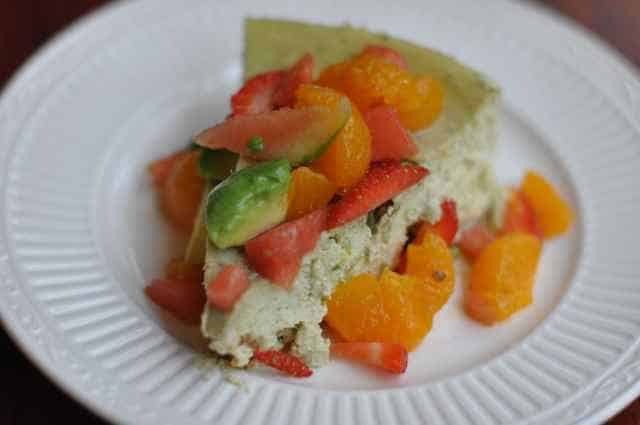 You can make a sweet avocado cheesecake. Preheat the oven to 300 degrees. Put almonds into a food processor and pulse until finely chopped. Add graham cracker crumbs, sugar, and melted butter, and pulse until just blended. Press crumb mixture into the bottom of a 9-inch springform pan. Set aside. Before starting your cream cheese mixture, allow all ingredients to reach room temperature. Letting the cream cheese, eggs, and sour cream reach room temperature will help the cheesecake from cracking. In a mixer combine cream cheese and sugar, and blend until smooth. Add eggs one at a time until they are incorporated into the batter. Place avocados into a food processor, and pulse until they are smooth, add lime zest, lime juice, rum, and sour cream, and pulse until you have a uniform mixture, add the avocado mixture into the cream cheese, and mix well. Pour into springform pan. Bake for 45 minutes, check to see if the cheesecake is set, it should still have a small jiggle in the middle when you bump the pan. Remove from oven, and cool completely on a rack. would lemon juice be ok as a sub for the lime juice, I don’t have a drop of lime juice, and not fond of going out in the rain just for that. Yes, it would be fine. Do you HAVE to use the rum? What temperature for the oven? I’ve used avocado in baking for years and just love how it adds creaminess and healthy fats! Mexican cuisine also uses avocado in dessert fairly often. This actually sounds great to me. . . now I have to see if I can adapt it to my own food restrictions. I love the idea of adding the fruit as a topping. I love desserts with Avocado, but unfortunately most people turn up their nose as soon as you tell them their sweets have Avocado in them. For this reason I just don’t tell them! Still trying to figure out what this will taste like, so I will have to try it. Thanks. After trying an avocado margarita I got more adventurous with other things avocado. It is creamy, more so than a regular cheesecake, the avocado flavor doesn’t dominate. It is worth trying, if you enjoy trying new flavors.